There are blueberries in this chocolate blueberry cake, a dark, delicious, dense, and almost brownie-like dessert. There’s something peaceful about picking blueberries, even when you have to stand on a ladder to do it. If you get up early enough, before the sun has a chance to set itself on Broil and the air still has a hint of morning cool, you can enjoy the bird songs as you hunt for the elusive “bigger berries” among the top branches of a 15-foot-tall bush/tree. For about 15 minutes. Then the realization sets in that the berries haven’t even reached the 1-quart line in your gallon bucket, the shady sides of the bushes have the fewest berries, and that bird whose nest you’re picking around sounds mad, really mad. Still, picking berries is something E and I look forward to every summer, more so this year because we missed last summer after our favorite pick-your-own farm went out of business. So when a friend recommended another orchard, smaller but with a friendly owner who trusts people to leave the $6 per gallon charge under a bucket while he takes a breakfast break, we made plans to get up early and get out there the next day, bringing our house guest, E’s friend G, along with us for an extra set of picking hands. We managed to pick a gallon apiece, which seemed a good idea until I got home with 3 gallons of blueberries and nothing to do with them. I decided to freeze two-thirds of them, so as soon as I got them home, I laid six kitchen towels out on my counters and kitchen table, spread out the berries, and started picking through them to remove stems, leaves, crushed berries, and the occasional spider. 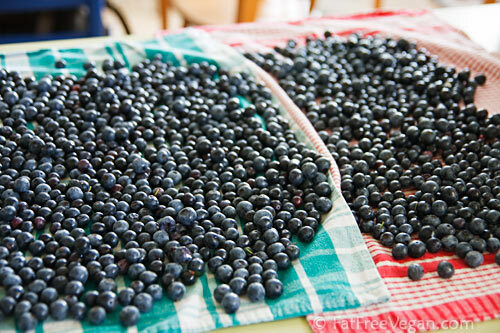 The berries were damp with morning dew and condensation, so I left them out on the counter to dry completely. After a couple of hours of drying, I pulled up the edges of the towels and funneled the berries into gallon-sized freezer bags and popped them into the freezer. I did not wash the berries, which would have made them wetter, so we’ll have to wash them as we use them. That still left a gallon of berries to eat up, so we started off by having blueberry pancakes for dinner, and for lunch the next day, I made blueberry vinaigrette for my salad. But neither of those meals put a dent in the shelf full of berries in my fridge. The girls were clamoring for a blueberry dessert, and I vaguely remembered a recipe I’d seen in Better Homes and Gardens that used blueberries in a chocolate cake. A quick internet search found it, Whole Wheat Chocolate-Blueberry Cake, the winner of BHG’s Annual Recipe Challenge. 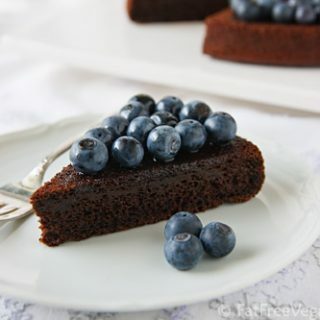 The photo was beautiful, and the idea of blueberries in chocolate cake batter was intriguing, but the recipe wasn’t vegan because of its use of egg and light whipped dessert topping nor was it fat-free because of the semisweet chocolate. So I used the basic idea for the cake and omitted the delicious-looking chocolate topping in favor of simple blueberries with a swirl of agave nectar. I also cut the sugar in half and used a new-to-me sweetener, organic date syrup, which really helped amplify the chocolate taste. The cake turned out dark, delicious, dense, and almost brownie-like; the predominant flavor is chocolate, the blueberry flavor coming mainly from the berries on top. Because it’s less sweet than most chocolate cakes, I considered it more of an “adult” dessert and worried that the kids wouldn’t like it, but both girls devoured their pieces and then demanded seconds. 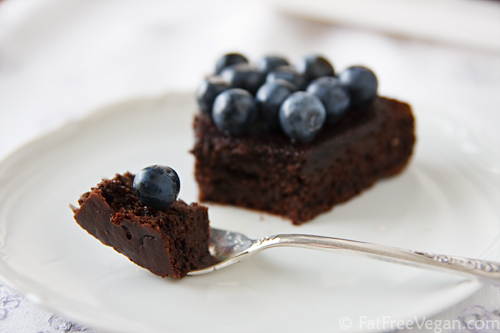 Dark, dense, and similar to a brownie, this cake contains no oil and is partially sweetened by blueberries. Preheat oven to 350 F. In a medium bowl, mix flour, cocoa powder, baking powder, baking soda, chia (or flax) and salt. In blender, combine water, 1/2 cup blueberries, and balsamic vinegar and blend until smooth. Make a well in the dry ingredients. Add the syrup and the blueberry mixture. Stir until completely mixed. Pour into an oiled 9-inch round cake pan. Bake 30 minutes or until a toothpick inserted in center comes out clean. Cool completely before inverting onto serving platter. 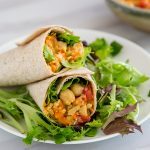 Did a little research after I noticed my recipes and photos had been ripped off and thought you might be interested to know that your work appears to have been ripped off as well. That’s horrible! Have you written to the blogger? It’s definitely a first to see my header photo on someon else’s site. The nerve! It is a cold rainy day today and I made this cake. I used frozen blueberries and topped it with a raspberry orange sauce and decadent small dark chocolate and cashew sprinkle. It looked beautiful and came out shockingly awesome. I have lived with my gf for 10 years and she remarked that she has never seen me make a cake. I tend to stick to the stove top side of cooking. She was happy about this experiment. I guess I’ve turned over a new leaf. I appreciate your work on FFV and look at contents OFTEN! I just made this – using strawberries instead of blueberries- and it was really awesome! Sorry for my bad english.. I’m just learning it in school for ~2 years now. Just wondering if I can replace whole wheat flour with spelt flour as I have problem finding the whole wheat flour in the supermarket. We have a big family reunion coming up, and I get to be the host. Once we finish up the family room decorating then I will begin to do the cooking. I’m not vegan but my sister and brother-in-law are. 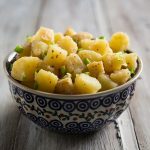 I always like to make some dishes that will appeal to them, and I think they’d love this! Thanks for sharing! I made this today for a party I was having. OMG!! So delicious. Thank you, thank you! Seriously one of the best cakes I have ever had. Hi Susan! I have only just found your blog today, but have already signed up for your newsletter and recipe box. 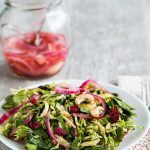 This is great and your site is so much easier to use than a lot of the regular recipe sites. I have been veg for 8 yrs and am making the transition to vegan(really having a hard time giving up cheese:-(. Also just found out that I need to go gluten-free due to tummy troubles. 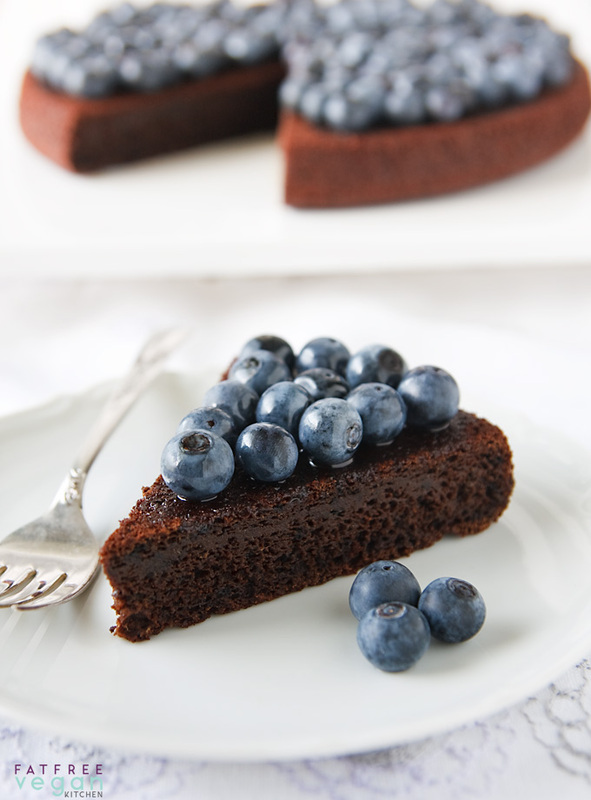 This chocolate blueberry cake sounds great, but do you know if I can sub brown rice flour for the WW? Any help you could give would be much appreciated. Thanks and keep up the good work! Made this cake last night; substituted agave nectar for the maple syrup and used ground flax seeds. Everything else in the recipe, I followed exactly. Since my oven tends to run on the hot side, I cooked for 25 minutes. It came out very moist and delicious! Oh, and it was super easy to mix up. My husband is finishing it off tonight. Thank you so much for all these wonderful recipes! I made this cake for dessert tonight and I can’t say I was much of a fan. It was completely devoid of sweetness and the only resemblance to chocolate was that it was brown. Thumbs down. Blueberry trees!? I guess I’ve never seen cultivated blueberry bushes… I’m used to picking them from wild plants (hardly big enough to call a bush!) usually less than a foot high! I found this post via Pinterest; the cake looks tasty! I made this the other day and was a little disappointed that it was dry…..I poured some almond milk on it, which helped a little. Any suggestions for making this good idea more moist?? This was SO GOOD! My boyfriend and I loved it. It’s just the two of us in the house so we knew couldn’t eat this all before it went stale. We ended up freezing half of it and it froze really well. Will definitely be making this again and again! This looks absolutely perfect! Almost too perfect to eat…almost! Made it twice now. Looks great and tastes even better! Just had a question.. does the recipe for require and form of butter/oil fat? thanks! i am reading and reading and reading again to make sure i hv not missed any ingredient. It is sitting in my oven now, fingers crossed! This is a wonderful recipe for a treat. I made it for New Year’s Eve, but I put the berries inside. A little batter, the berries, the rest of the batter. It came out wonderfully moist and delicious. The berries don’t roll off that way. Love this one for a special treat!! Thanks for your comment Denise. I will try this next time. hi… can i ommit the balsamic vinegar? You must replace it with some other type of vinegar because if you omit it completely, the cake won’t rise properly. Thank you so much for your wonderful work on your web site. I wanted to make Chocolate cup cake yesterday for Valentine’s Day, but I did not want to make same one as I made last year, because of oil. I found your recipe! As I did not have all ingredients, I could not follow all, but it turned so delicious! Your recipe is so good. Looks delish! Can I use frozen instead of fresh blueberries? Also, I don’t have white whole wheat flour so can I do half all-purpose and half whole wheat? What if I did 1/2 c. white and 1/2 c. whole with 1/4 c. brown rice? Sorry for the confusion, but variety is the spice of life! I just made this cake. I drizzled it with agave and my three year old enjoyed it. next time I will add some additional blueberries, apples, or oranges. This recipe is a keeper since I routinely have the necessary ingredients at home. I bought a quart of blueberries at a farmstand yesterday with the intent of eating them plain because i figured i couldn’t eat any of the dishes I would make with them. …then this popped up on facebook and i happened to have all the ingredients in my kitchen. I used decaf coffee in place of the water and made cupcakes because i seem to have problems with things sticking to the pan, but that just meant they were ready to eat faster and preportioned 🙂 Also for those asking about using half wheat and half white wheat. I did because i was running out of the white whole wheat flour and they were still good. Does this recipe work with other berries such as raspberries? I haven’t tried it with other berries, but I don’t see why not. This has been my go-to vegan chocolate recipe for a while, but last night I tweaked it a bit and it turned out even richer! Instead of 3/4 water, I used 3/4 hot black coffee. I’ve read that the flavour of the coffee elevates the richness of the chocolate, so I figured – why not try it out? And my gosh the results were so delicious! Thank you for all the yummy recipes. Is this (lovely looking) cake still tasting nice the next day? Looking forward to trying this. Where I live we crawl around on hands and knees to pick blue berries. I had to look on web, I couldn’t believe your comments on ladders, I thought you were speaking ” tongue in cheek”. Tried this cake for Father’s Day, and it turned out incredible!! I was a bit worried because the batter seemed quite tough, almost the consistency of brownies, and I was afraid it would come out dry. I was gladly mistaken! It was very moist and delicious and I also found a vegan chocolate glaze for it. Just mix 2 tbsp of unsweetened cocoa powder with 2 tbsp of almond or soy milk and 2 tbsp of margarine as well as 1/4 or 1/3 cup of agave syrup. Pop it into the microwave for 25 seconds or until it is fully melted and drizzle it on the cake. It came out amazing! I just topped the cake with some raspberries and banana chunks and luckily the glaze also acted as a glue to hold the toppings in place. Great to know there are vegan alternatives to classic, decadent desserts! Thank you Susan – another great recipe! I used 1/4 cup of almond flour, 1/2 cup of buckwheat flour and 1/2 cup of whole wheat pastry flour. The cake was so moist! Will definitely be making again. After reading this article, It is very easy to make. We have prepared this cake many times, because our children loves it very much. It is too tasty!!!!!!!!! we made it on last Sunday.. If you email a photo to susan@ FatFreevegan dot com, I’ll try to add it to your comment. I’m happy to hear how much you like it! I am not vegan free person. So instead of water can i use milk?? instead of balsamic vinegar can i use regular or apple cider vinegar?? I made this cake along with your chocolate zucchini brownie recipe for a vegan birthday party. Both were eaten and LOVED by young (4-71 yr. ) and old people who are following and some not following a plant based diet. Since the birthday honoree loves chocolate and peanut butter I had some extra peanut butter frosting (vegan) left over so put that on top of the brownies followed by your frosting in the recipe and it was yummy. On the chocolate cake,, I added a very small layer of chocolate ganache so the blueberries would “stick” to the cake. I then put sliced strawberries around the cake on the serving plate and it looked so pretty! Wish I had thought to take a picture of the finished cake- will do so next time. Quick question- in the cake could I swap out diced dates for the 1/4 of sugar? Thanks for such yummy recipes- love your blog and site. Susan, I love your recipes so much and this was SO good. I actually omitted the flax seed and liquid sweetener. I used Lakanto instead and added about 1/2 cup organic unsweetened applesauce. I also used cider vinegar instead of balsamic and an additional 1/2 cup of blueberries the batter verses adding it on top for serving. It was delicious! Mine rang in at just 20 calories a piece!… caught myself eating 4 at a time, HA! I used an 8×8 and cut into 16. 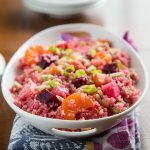 Thank You for this fabulous recipe and ALL of your amazing recipes!